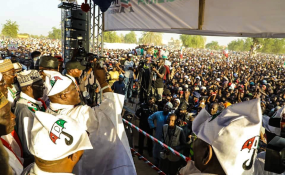 The presidential candidate of the Peoples Democratic Party (PDP) Atiku Abubakar, on Monday, at a campaign rally in Jigawa said President Muhammadu Buhari is not "a full-fledged Fulani man because he cannot speak Fulfulde." Mr Abubakar, who described Mr Buhari as fake Fulani man, said "a real Fulani man would not drag his followers into extreme poverty like what is happening under the APC administration". Mr Abubakar was in Jigawa to solicit for support from the electorate to unseat the incumbent next month. He promised to execute three projects for Jigawa if elected president in next month's presidential election. He said the projects, "as requested" by a former governor, Sule Lamido, include the dredging of Hadejia river valley; construction of Gaya-Jahun to Kafin Hausa road and the construction of Kwanar Dumawa to Babura road. In his remarks, Mr Lamido urged Jigawa electorate to vote for Mr Abubakar, saying the 2019 election is "between competence and incompetence, genuine civilian candidate (Atiku) and and‎ fake civilian candidate (Buhari)." He also urged the people of Jigawa to vote for the party's candidate. "The crowd is overwhelming at all the venues of our campaign and Jigawa State is not an exception. It is based on this that we are warning INEC against any attempt to manupulate this year's election," he said.